Tibia is the most commonly fractured long bone in the body. The annual incidence of tibial shaft fractures is 2/1000 individuals. 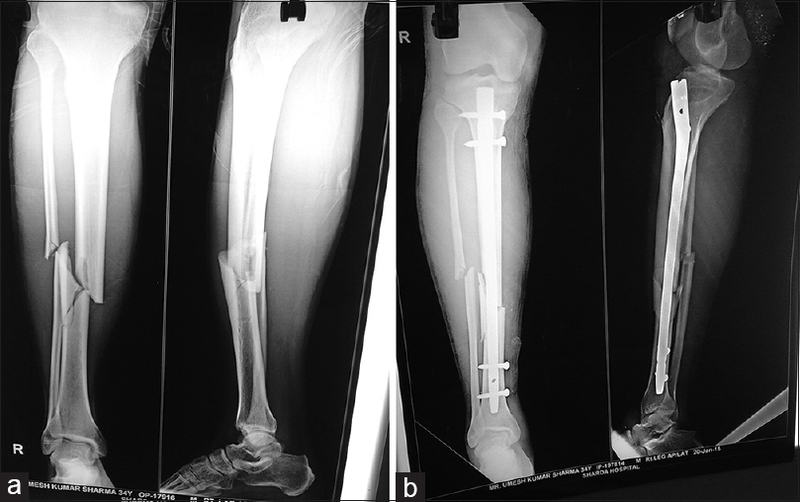 The complications of the nonoperative treatment of displaced tibial shaft fractures that are the result of high-energy forces are associated with a high prevalence of malunion, stiffness of the joint, and poor functional outcome. Closed displaced tibial shaft fractures have been internally fixed with plates or with intramedullary fixation devices such as centromedullary nails (K-nails and V-nails), interlocking intramedullary nails (reamed or unreamed), or multiple flexible intramedullary pins, for example, Ender nails., Intramedullary interlocking (IMIL) tibial nailing is considered the best modality of treatment of diaphyseal tibial fractures.,, It has a biological and biomechanical advantage over plate osteosynthesis. Various studies regarding the safety and effectiveness of closed IMIL nailing have been done.,,, The C-arm image intensifier is generally used for closed reduction, closed nailing, and locking bolts proximally and distally. The objective of this prospective study is to achieve the ultimate goal of fracture union and early rehabilitation, short hospitalization, and good fracture healing response. This prospective study was carried out at Orthopaedics Department of SMS and R, Sharda University, from December 2010 to December 2015. It was approved by the Institutional Medical Ethics Committee. A total of 278 patients with fracture shaft of tibia admitted to our institute were included in the present study. A written informed consent was obtained from all the patients; they were explained about treatment plan, cost of operation, hospital stay after surgery, and complications of anesthesia. They were followed up after surgery and were clinically and radiologically assessed for fracture healing, joint movements, and implant failure. According to the criteria, the results are graded as excellent when the fractures unite within 16 weeks without any complication, good when union occurs within 24 weeks with treatable complications such as superficial infection and knee/ankle stiffness, and poor when union occurs before or after 24 weeks with one or more permanent complications such as infection (osteomyelitis), implant failure, nonunion, limb shortening, and permanent knee/ankle stiffness. Delayed union was recorded when the fracture united between 3 and 6 months while nonunion was noted when union had not occurred after 8 months of treatment. Follow-up was done. Patients with closed tibial fracture with age more than 16 years, patients who presented within a week of the injury, and patients who did not have any previous surgical treatment for the fracture were included in the study. Malnourished patients and those with open fractures, pathological fractures, and fracture nonunion were excluded from the study. Examination of patients was done thoroughly at the time of admission to exclude other injuries. In majority of the patients, closed reamed interlocking nailing of the tibia was performed within the 7th–14th days of injury. In patients who were not fit for surgery due to associated injuries to vital organs, were hemodynamically unstable or due to active infection at injury site, or were pyrexial, delayed interlocking nailing was performed when their overall condition improved. The patients were placed supine on a normal table. The tibia was approached with the midline patellar incision which extends from the lower pole of the patella to just 1 cm distal to the tibial tuberosity. The entry point was made after retracting the patellar tendon in line with medial half of tibial tuberosity about 1.5–2 cm distal to the joint line. Care was taken to flex the knee joint while making the entry point. After the entry point was connected to the medullary canal, an olive-tipped guidewire was passed. The fracture was reduced by longitudinal traction and manipulation under image intensification. After reduction, the guidewire was passed in the distal fragment and centered in anteroposterior and lateral projections. After sequentially incremental reaming, the guidewire was exchanged and appropriately sized nail inserted. Proximal locking was done by means of the jig, the fracture was impacted, and distal locking was done by freehand technique. All patients were followed for a minimum of 9 months. There were 236 static nails used and 42 dynamic nails used. Proximal locking was done with jig and distal locking with freehand technique. Wound was closed with suction drain in standard manner, and antiseptic dressing was done. Drain was removed on the 2nd postoperative day. Rehabilitation such as touch-down weight-bearing was started on the 2nd postoperative day, and sutures were removed on the 14th postoperative day. These patients were assessed clinically and radiologically for union timing at 9 months following surgery [Figure 1]a, [Figure 1]b and [Figure 2]a, [Figure 2]b. Patients were assessed for delayed union (more than 4–6 weeks postoperative) and nonunion (9 months following surgery). Statically analysis was limited to calculation of percentage of patients who had unions, malunions, delayed unions, or nonunions and excellent, good, and poor outcomes [Table 1]. Functional outcomes were evaluated according to the Johner and Wruhs criteria. There were 278 patients in this study, 79.13% (220/278) patients were male, and 20.86% (58/278) patients were female. About 64.74% patients had tibial fractures at middle one-third, 19.42% (54/278) at proximal one-third, and 15.82% (44/278) at distal one-third [Table 2] and [Table 3]. The patients were divided into three groups according to their age for simplicity. Young age group included those patients whose age was <40 years. In this group, there were 11.51% (32/278) females and 43.88% (122/278) males. Middle age group included patients, who were between the ages of 40 and 60 years. This group included 5.75% (16/278) females and 23.74% (66/278) males. Old age group included patients older than 60 years. This group consisted of 3.59% (10/278) females and 11.51% (32/278) males. Nearly 11.51% (32/278) patients were diabetics and 4.31% (12/278) of them were taking insulin. About 2.87% (8/278) female patients were diabetic, and they were taking oral hypoglycemic. The clinical results of our study were rated on the basis of the criteria of union, nonunion, delayed union, or malunion. The patients were followed according to their clinical status. Almost 86.33% (240/278) patients had union in 90–150 days with a mean of 110.68. Nearly 11.51% (32/278) of our patients had diabetes. Union was achieved in 10.07% (28/278) patients in 95–109 days with a mean of 103.38 [Table 1], [Table 4] and [Figure 1]a, [Figure 1]b, [Figure 2]a, [Figure 2]b. Rehabilitation: We allowed our patients to start touch-down walking with crutches on the 2nd day of operation as they feel comfortable. All patients, except ten, started partial weight-bearing on the 6th week and full weight-bearing on the 12th week. These ten patients had nonweight-bearing ambulation till the callus became visible on radiographs. They had comminution at fracture site. All of our patients had a full range of motion of their knees and ankles. About 4.31% (12/278) patients complained postoperative knee pain, which was spontaneously resolved in 2 weeks. Our 15.10% (42/278) patients needed dynamization within 6 weeks because of obvious gap at the fracture site in subsequent radiographs. This was due to over distraction of fracture during operation. They were dynamized before starting partial weight-bearing. The screw of less critical stability was determined (the screw which was away from the fracture) and it was removed in local anesthesia. There were 9.35% (26/278) delayed unions which were treated by dynamization. In our study, only 4.31% (12/278) of our patients were labeled as nonunion and were treated by bone graft and dynamization. The results were excellent in 86.33% (240/278), good in 9.35% (26/278), and poor in 4.31% (12/278) patients. IMIL nailing has become a popular and effective procedure for the treatment of tibial shaft fractures. Interlocking nails are generally performed using an image intensifier. In our study, the vehicular accident injury was the most common mode of injury consisting of 59.13%. The other modes of injury were 6.25% due to fall, 3.84% due to labor accident, and 30.76% due to direct force injury or physical assaults. There were 42% transverse, 32% oblique, 10% spiral, 4% segmental, and 12% comminuted fractures. Hooper et al. (1991) reported transverse (48%), oblique (42%), spiral (6%), and segmental (4%) fractures in their series. In this series, tibial fractures were the most common at middle third (64.74%) and upper third (19.42%), followed by lower third (15.82%). Larsen et al. studied 45 patients with reamed interlock nail in whom average time to fracture healing was 16.7 weeks and had two malunion, while in our study, union occurred in 90–150 days with a mean of 110.68 days with no malnunion which is very close to other studies. In our study, we did nailing after reaming the canal. This is a routine protocol in our center. There are various reported literature which show increased blood loss, increased operating time, increased risk of pulmonary embolism, and adult respiratory distress syndrome after reamed interlocking nail. We have a reasonable policy to wait and stabilize the patient who has certain risk factors such as associated chest trauma and anemia. When the patient is stable and fit for surgery, we perform closed reamed statically locked intramedullary nail. The complication such as infection was encountered, consisting of 12 cases superficial infections (4.31%) which were treated with appropriate antibiotics for the period of 2 weeks. In our center, we routinely perform the locking in static mode. In this study, all the fractures were treated with statically locked intramedullary nail. Two hundred and forty out of 278 patients were united without any complication. Forty-two of our patients needed dynamization, i.e., removal of proximal or distal screw before starting partial weight-bearing. Twenty-six patients showed no radiological signs of union at the 4th month. They were dynamized and were encouraged to walk with bearing full weight. Twelve of our patients had nonunion. He was treated with bone graft. In our study, union rate is 86.33% which is very close to the reported series. Various studies have documented 97%–100% union rate after reamed locked nailing of tibial shaft fractures. Ekeland recommends conversion of static nailing to dynamic nailing at 3 months for better consolidation of the fracture, and in case of comminuted fractures, we can increase the time to 5 months. The functional outcome of patients with tibial shaft fracture is probably the most important consideration when deciding on the best mode of treatment for a particular fracture pattern. Successful early fracture union in tibial shaft fracture is the most demanding outcome for good function in addition to other factors. A potential limitation of our study was the absence of a control group treated by a different modality. In a subjective measure of outcome at follow-up, 240 (86.33%) of the patients were excellent and 26 (9.35%) good; no patients or parents reported their outcome as not satisfied [Table 1]. At follow-up, all patients went on to osseous union and regained a full range of movement after rehabilitation. Closed interlocking nailing in tibial shaft fracture allows earlier weight-bearing leading to earlier fracture union with less morbidity. Because of the high union rate and low infection rate, we consider closed interlocking nailing as the best mode of treatment for tibial shaft fractures. Batta V, Dwyer AJ, Gulati A, Prakash J, Mam MK, John B, et al. No difference in the long term final functional outcome after nailing or cast bracing of high energy displaced tibial shaft fractures. J Trauma Manag Outcomes 2012;6:5. Tonk G, Menwal G, Gupta AK, Rustagi N, Kumar A. Anterior knee pain in transtendinous and paratendinous aprroaches of tibia interlocking nail: A comparative study. J Evol Med Dent Sci 2014;3:7874-80. Rose KM. Update in tibia intramedullary nailing: Percutaneous suprapatellar access route with the knee in semi extended position for intramedullary stabilization of tibia fractures. Tech Orthop 2014;29:56-61. Kamal Y, Khan HA, Gani NU, Gul S, Lone AA, Singh D. role of primary intramedullary interlocking nail in compound Gustilo-IIIA tibia fracture in developing world. Int J Health Sci Res 2014;4:151-8. Mitkovic M, Milenkovic S, Micic I, Mladenovic D, Mitkovic M. Results of the femur fractures treated with the new selfdynamisable internal fixator (SIF). Eur J Trauma Emerg Surg 2012;38:191-200. Wähnert D, Stolarczyk Y, Hoffmeier KL, Raschke MJ, Hofmann GO, Mückley T, et al. Long-term stability of angle-stable versus conventional locked intramedullary nails in distal tibia fractures. BMC Musculoskelet Disord 2013;14:66. Rose DM, Smith TO, Nielsen D, Hing CB. Expandable intramedullary nails in lower limb trauma: A systematic review of clinical and radiological outcomes. Strategies Trauma Limb Reconstr 2013;8:1-2. Kanhei RA. Orthopaedic Surgery. Disst. University of Seychelles; 2012. Li CX, Zhao HJ, Zhao WQ, Xu YQ. System evaluation on reamed and non-reamed intramedullary nailing in the treatment of closed tibial fracture. Acta Cir Bras 2013;28:744-50. Schemitsch EH, Bhandari M, Guyatt G, Sanders DW, Swiontkowski M, Tornetta P, et al. Prognostic factors for predicting outcomes after intramedullary nailing of the tibia. J Bone Joint Surg Am 2012;94:1786-93. Kafle D. Management of fracture shaft of tibia by closed interlocking intramedullay nailing non-reaming versus reaming. J Inst Med 2013;36:83-91. Johner R, Wruhs O. Classification of tibial shaft fractures and correlation with results after rigid internal fixation. Clin Orthop 1983;178:7-25. 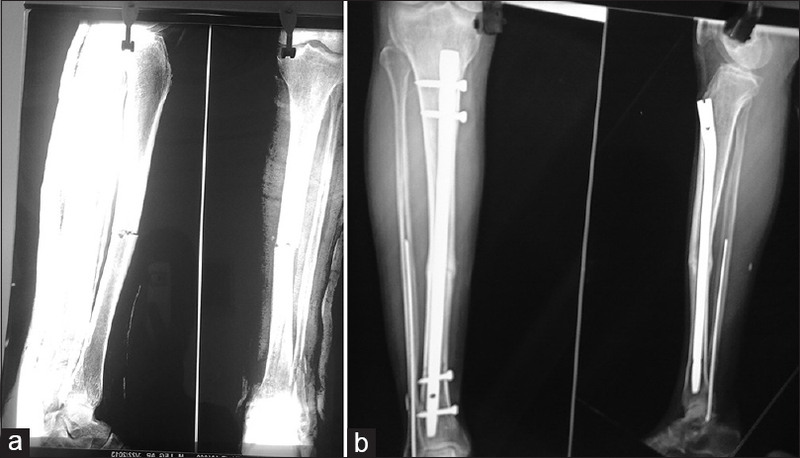 Sahu R. Percutaneous k-wire fixation for femur shaft fractures in children: A treatment concepts for developing countries. Ann Med Health Sci Res 2013;3:197-201. Hooper GJ, Keddell RG, Penny ID. Coservative management of closed nailing for tibial shaft fracture. A randomized prospective trial. J Bone Joint Surg Br. 1991;73:83-5. Larsen LB, Madsen JE, Høiness PR, Øvre S. Should insertion of intramedullary nails for tibial fractures be with or without reaming? A prospective, randomized study with 3.8 years' follow-up. J Orthop Trauma 2004;18:144-9. Ekeland A, Thoresen BO, Alho A, Stromsoc K, Folleras G, Hankeko A. interlocking intramedullary nailing in the treatment of tibial fractures, A report of 45 cases. Clin Ortho 1988;231:205-15.